Whatever Happened to Betsy Blake? 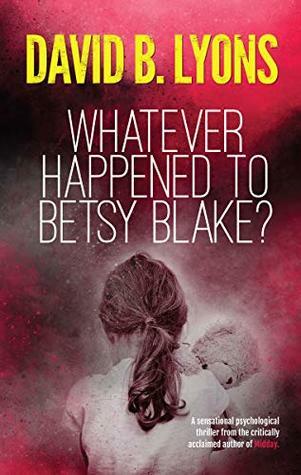 A haunting psychological thriller by David B. Lyons @TheOpenAuthor #ebook #PaperBack #crimefiction #crimethriller #KindleUnlimited #BlogReview #WhateverHappenedToBetsyBlake? If your daughter went missing, how many years would it take for you to admit she’s never coming home? Whatever Happened to Betsy Blake? will stay in your head for a long time. A very, very long time. This book has knocked my top read of the year of its number one position and I would even go as far as to say it is in my top 5 reads ever. So clear time to savour this book because it is one to be read in one sitting, somewhere your emotions can pour out of you because boy did I cry. I literally feel like I have been hit with a tsunami of emotions that haven’t finished with me yet. The chapters come in alternating heartbreak of a guilt ridden father that took his eye from his 4-year-old child playing in the street just for a second, then she was gone, to a terrified Betsy telling how she had been playing when a man put his hand over her mouth and whisked her away in his car and into his cellar. Some 17 years had passed and Gordan Blake is now in hospital waiting for an operation where he only has a 50% survival rate and he was no nearer to finding out who had taken her. As far as everyone else is concerned the case is closed. In a final desperate attempt he rings a random local P.I. Lenny Moon with an offer he couldn’t refuse. Bring him a new piece of information that he hadn’t had before and he would leave him his million euro house to him, if he doesn’t survive the surgery later in the day. Plus a thousand euros for the day as expenses and fee. The race is on and soon it is clear that Lenny is way out of his depth with the people he is tracking down. As the hours are ticking down in the day the story jumps back to the past with the years of Betsy’s captivity being told by her as the relationship between her and the man constantly change. Some of the scenes are brutal and the beatings horrendous but mostly it is when the man won’t talk to her of forgive her that hurts her the most. Reading Betsy’s words made me feel so very humble because it was the simplest things in life where she found pleasure, the things that we take as a right to have. The story increases in speed and intensity as Gordon Blake’s operation approaches and time for Lenny and Betsy is running out, then it becomes completely unbearable. OMG these words just sizzled. I so wanted Gordan to pull through as I had grown so very fond of this man and yet the house would be life changing for Lenny Moon and his complicated family. But most of all what of Betsy? This is one mind-blowing story where you need to read to find out ………………………. Whatever Happened to Betsy Blake? As if I need more books. Great review Sue. Fab review, I will add this to my wishlist.